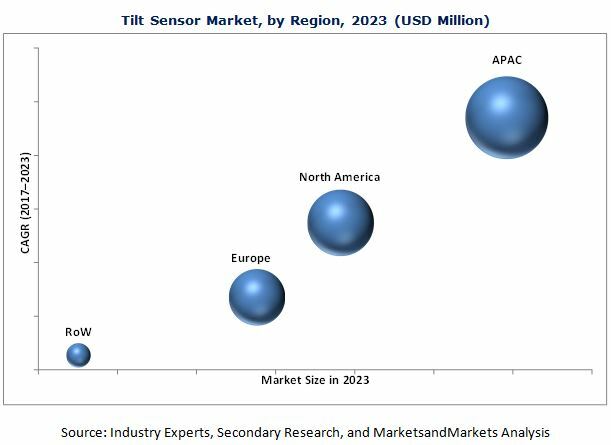 Tilt sensor market [121 Pages Report] is expected to grow from USD 162.5 million in 2017 to USD 260.3 million by 2023, at a CAGR of 8.17% from 2017 to 2023. The growth of this market can be attributed to the ability of these sensors to provide information on the tilting position of objects, which is crucial in various applications for making decisions related to operations as well as for ensuring safety. These sensors are being used in many verticals such as mining, construction, aerospace, defense, automotive, transportation, and telecommunication. The base year used for this study is 2016, and the forecast period considered is between 2017 and 2023. The mining and construction vertical is the largest demand generating segment for the tilt sensors. These sensors are used in a number of mining and construction equipment and machines such as drilling machines, mobile and stationary cranes, and structural monitoring systems. Tilt sensors are applied for providing crucial information about the tilting position of the object with reference to gravity. Moreover, factors such as large-scale investments for infrastructural development, rise in urbanization, and increase in construction activities in emerging economies has led to the rise in the demand for construction equipment. This rise in demand for construction equipment is further expected to fuel the growth of tilt sensor market. To analyze the opportunities in the market for stakeholders by identifying the high-growth segments. The research methodology used to estimate and forecast begins with obtaining data on key vendor revenues through secondary research. Some of the secondary sources used in this research include information from various journals and databases such as IEEE journals, sensor journals, Factiva, Hoovers, and OneSource. Moreover, the vendor offerings have been taken into consideration to determine the market segmentation. The bottom-up procedure has been employed to arrive at the overall size from the revenue of the key players in the market. Note 1: “Others” includes sales managers, marketing managers, and product managers. Note 2: Tier 1 companies include companies with revenues more than USD 1 billion; tier 2 companies have revenues between USD 1 billion and USD 0.5 billion; and tier 3 companies have revenues up to USD 0.5 billion. The tilt sensor ecosystem comprises tilt sensor vendors such as TE Connectivity (Switzerland), SICK (Germany), Murata Manufacturing (Japan), Pepperl+Fuchs Vertrieb (Germany), and Level Developments (UK) who sell these products and solutions to end users according to their unique requirements. The end users of tilt sensor industry consists of companies such as mining and construction, aerospace and defense, automotive and transportation, and telecommunications. What are new verticals which the tilt sensor companies are exploring? Which are the key players in the market? The report covers the tilt sensor market on the basis of housing material type, technology, vertical, and geography. The said market is expected to be led by tilt sensors with nonmetal housing material during the forecast period. The growth of this market is being propelled by the high demand for tilt sensors with plastic housing material. The tilt sensor based on MEMS technology is expected to witness a significant growth in this market during the forecast period. The small size and low cost of this sensor is the major factor leading to its high growth rate in the said market. Asia Pacific (APAC) held the largest size of the in 2016 and is expected to witness the highest growth rate during the forecast period. China, Japan, and India are some of the major countries driving the growth of the said market in APAC. APAC is home to a number of prominent mining and construction, aerospace and defense, and automotive and transportation companies. This is one of the major factors that has led to the dominant position of APAC in the overall tilt sensor market. Moreover, a number of key players operating in this market are based in APAC. This factor has a positive impact on the said market in APAC. To know about the assumptions considered for the study, Tilt sensor applications in mining and construction vertical drive the growth of tilt sensor industry. Mining and construction is the largest vertical where tilt sensors are being utilized. Tilt sensors are required in drilling machines, hydraulic leveling and road construction machines, mobile and stationary cranes, mining equipment, and aerial lift platform leveling systems. The tilt sensors required for applications in mining and construction vertical needs to be robust as they have to withstand extremely harsh conditions such as shock, vibration, dust, very high or low temperature, and moisture. Aerospace and defense is another major vertical where tilt sensors are widely being utilized. Some of the major application areas of the tilt sensor in the aerospace and defense vertical are weapons platform leveling, radar and antenna leveling, production or manufacturing equipment, fire control systems of battle tanks, and missile launches. The automotive and transportation vertical is expected to grow a significant rate in the tilt sensor industry during the forecast period. 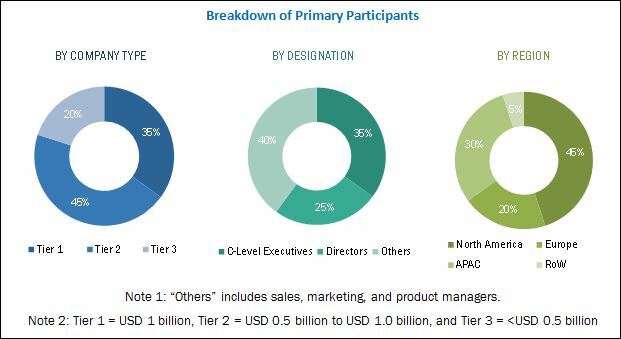 The high adoption of tilt sensors in security systems for protecting the theft of wheels and tires is one of the major reasons fueling the growth of tilt sensor market for automotive and transportation vertical. Moreover, the extensive use of tilt sensors in the railway industry for various applications including measurement of railway track position, alignment and maintenance of railway track, and in train control systems is also leading to the growth of this market. What are the upcoming verticals for tilt sensors? The tilt sensors based on force balance technology have a high accuracy level; however, these sensors are expensive than the tilt sensors based on other technologies such as MEMS and fluid filled. This is one of the major factors limiting the growth of the said market. Some of the major companies operating in the tilt sensor industry are TE Connectivity (Switzerland), SICK (Germany), Murata Manufacturing (Japan), Pepperl+Fuchs Vertrieb (Germany), and Balluff (Germany). 11.4 Murata Manufacturing Co., Ltd.